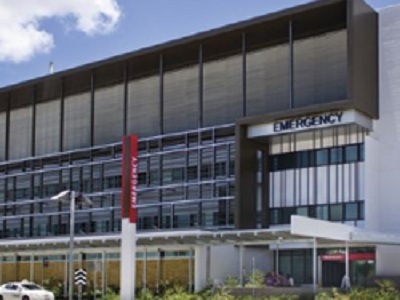 A complete range of healthcare tapware and customised stainless steel grating products from Galvin Engineering was specified to meet and exceed infection control guidelines at the Townsville Hospital in North Queensland. Designed by Cox Rayner architects, the Townsville Hospital redevelopment (stages 3 & 4) deliver a Clinical Support and Services Building, Cancer Care Expansion (Oncology), Clinical Ward Block (South Block) and Pathology Laboratory Expansion. Being a healthcare services environment, user groups and healthcare professionals demanded a high level of hand hygiene in line with current infection control guidelines. It was, therefore, important to ensure that the selected tapware and grating minimised the risk of infection and germ contamination. Galvin Engineering's healthcare tapware and customised stainless steel grating products were selected for the Townsville Hospital redevelopment project. Featuring a modern streamlined aesthetic, the CliniLever and hands-free tapware range delivers multiple functional advantages including user-friendly operation, simple maintenance and easy cleaning. All Galvin Engineering taps are supplied with laminar flow devices to minimise the spread of legionella.